Have I mentioned that I love working with polymer clay?! Here's another reason: you don't need a truckload of fancy equipment to create really beautiful items, you can often 'make do' with tools you have lying around the house. 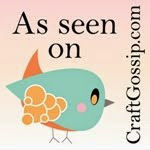 That doesn't necessarily mean you spend any less money on this craft. It just means those aisles and sections perhaps little heeded before clay took over your life, like kitchenware, are now a wonderland before your very eyes. They are filled with intrigue and the allure of possibility! Image 1 below is makin' do at its best! 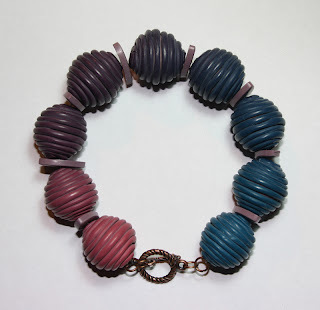 The tutorial for these wicked looking beads is in Carol Blackburn's book Making Polymer Clay Beads. In the tutorial she uses a clay extruder tool to make the snakes. In the absence of an extruder, I just rolled the snakes of clay from a skinner blend by hand and applied these to the beads. Sure, it was probably a lot more fiddly than if I had an extruder and my snakes are nowhere near perfect, but I think it adds some charm! I made this bracelet for my awesome honours student, Marcela, for her 21st birthday. Hi Noob Beader, I was browsing thru The Aus Polyclay forum, and saw your site. Congrats on finding Polymer Clay. It is a great medium, and so creative. There is so much out there to see and learn. I too have the Carol Blackburn Book. think it is one of the best. I am lucky enough to have a Makins Extruder, which is one of the best evr. If you get one you will never regret it. I started PC about 2005, and am still so taken with it.Also have been in the forum since about 2006, know a lot of them as went to Canberra about 6 or 7 for a Poly clay retreat . I do have a blog but havent been there for awile ,must try to get back to that. At the moment I am teaching PC to a small class and our lesson tomorrow is Lisa Pavelkas Magic Gloss. It is what I call Faux Dichoric. You would never beleive pc could look like it does with this Resin cover. Hope you learn lots and post some of your creations here. You're so lucky to have been to a clay retreat and met some of the other aussie polyclayers, I'll have to keep my eye out for when there's another one - I'd love to go to one! Where do you teach your classes? I'm in Brissy and haven't yet found any local classes or workshops. After reading what you and a couple of others have said about extruders, it is now number 1 on my shopping list. I will have to check out your blog and keep track of your claying antics!! I think they are either at Maleny or Montville, so I think going to that blog will explain it.